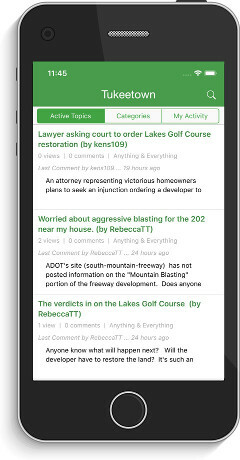 Looking for the best way to stay informed on what’s going on in Ahwatukee? Tukeetown.com is the easiest way to meet and communicate with your neighbors. Whether you are looking for a new school for your family, a gym to join, or just want to share some great new renovations you did to your house–Tukeetown connects you with your neighbors in an easy-to-use online message board. Best of all, it’s easy and 100% free to join! Discuss anything and everything Ahwatukee with your neighbors. Find local listings to buy and sell with Ahwatukee residents. Get information and dates on upcoming local events. Listen to the latest Ahwatukee Uncensored or upload your own! Stay up-to-date on recent headlines. Never miss another post, message or alert by downloading the Tukeetown app on your android or IOS device!